These core principles have guided my approach to designing communications for many years. I’ve committed them to writing here, with the hope that others might find them useful. Let me know if they are. In traditional Chinese culture, ch'i (or qi) is an internal vital energy — the life force that animates all living things. 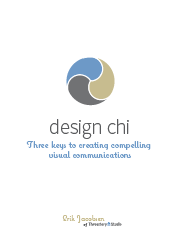 Compelling visual communication is alive: it grabs attention, engages the reader, and delivers a message that matters. And sticks. Examining visual communications through this three-part lens can help you create pieces that come alive. Like a glass of pure water, clarity in communication is refreshing — and a lot easier to swallow. Cluttered design is often the result of cluttered thinking. Take time to clear up your thinking first, then make your communication consistent with your thinking. Clarity starts with understanding your purpose. What is it that you really need to communicate? Identify your core message and give it room to breathe. Clarity is essential. Like water. Remember that on the other side of every presentation you make, every article you publish, every communication piece you create, is a human being. Concern for the man himself and his fate must always form the chief interest of all technical endeavors… Never forget this in the midst of your diagrams and equations. Or in the midst of your web pages or brochures. Ignore the humanity in your audience and your communications become cold and forgettable. The warmth of humanity helps readers open up to receive the message you have for them. ffective communication is a core of truth. No amount of good design will help if this essential core is missing. Nothing undermines communication more completely than the sense that perception doesn’t align with reality. So, start with solid data, with good research, with as complete an understanding of your subject as possible. If there are holes, fill them, or be clear about the gaps. Visual integrity reinforces content integrity. The deliberate and consistent use of design elements — colors, fonts, margins, sizes, line weights, imagery — holds a design together and builds confidence in the content. You may think that two out of three isn’t bad. Not so. All are essential. If you miss a piece, you’re headed for trouble. If communications have integrity and make a human connection, but lack clarity, they will be confusing. Your message will be lost. Focus on what’s essential, then clear away the clutter to bring clarity back. Clear communications that are grounded in truth, but fail to appeal to my humanity, are cold and forgettable. Think about why what you have to say would matter to your audience, then take the time to make a real connection. Communications that speak clearly and strike a human chord, but lack integrity, are certainly misleading, probably unethical, and perhaps criminal. This is what gives marketing a bad name. Don’t do it. I’ve written a short e-book based on these principles. It includes some additional tips and questions to guide your design process, as well as a one-page worksheet. You can download the e-book here.